We finished course set-up around 8:05 and I returned to our home base to find 10 or 15 runners had already gathered. As I met and chatted with a few of the folks, I was heartened to more coming. Then came entire families with bikes & strollers. We circled, made announcements, honored our fallen heroes, and hit the trail. Passing through the neighborhood, I watched as folks took notice of our blue…wondering what we were all about. “Do I have to have a blue shirt to run with you?” one lady asked. A smile crossed my face, “No…no blue shirt required…come on out…we’d love to have you!” Any hesitation I might have had about our group of 60 running through a new neighborhood melted away as the power of our living memorial sank in. Our heroes were honored that day. Soon enough, folks will come to expect wear blue in their neighborhood on Saturday mornings. I think I might get a little choked up the first time I see someone fly an American flag because they know we are coming by…or see a young child get excited to see us running by their home. That’s a good thing. It reinforces what we do. We encourage our neighbors to remember the sacrifice of the American military. They in turn encourage us to keep coming out, creating the layers of our community. The day was fantastic. Shortly after the bulk of our runners returned from the course, the bottom fell out. What a relief! I was glad it held off until after our Circle of Remembrance. We packed up the gear, and I headed into my day happy that we were open for business. I had a chance to think more about our first run the next day. I went on a long run Sunday afternoon and passed through a portion of our course. It was awesome, because in the beauty of that wooded trail, with rays of the setting sun piercing through the trees, I saw our wear blue stenciled on the path and it made me realize that I’d never look at that stretch of path the same way again. For on that path, my steps were purposeful. My mind wandered to a friend lost. I thought of people in our Circle of Remembrance, the names, and the families. That’s the power of wear blue. 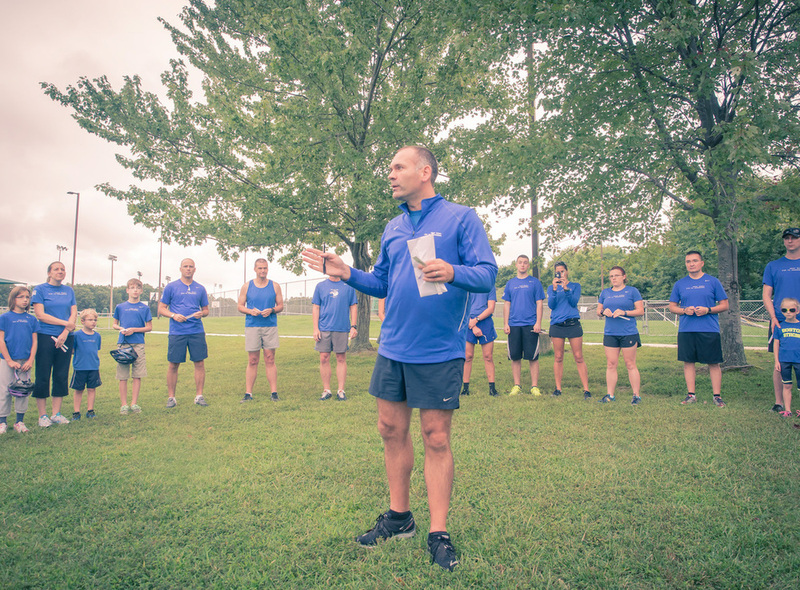 The Springfield, VA/DC chapter meets every Saturday morning (rain or shine) at 0830 at South Run Park (7550 Reservation Road, Springfield, VA 22153). Runs are always free and open to all. Please come join the wear blue community for our weekly runs.